Bandai Namco have revealed the next character joining the roster of upcoming sword-and-sorcery fighter Soulcalibur VI. It's non-other than Tekken veteran Yoshimitsu, making yet another appearance on the Stage of History. The head of the mysterious Manji clan returns to the ring, sword in hand, to lay waste to the opponent with his unique, often bizarre fighting techniques. As is always the case for the demon ninja, Yoshimitsu is rocking a whole new look for this, his sixth Soulcalibur appearance, having only been absent in the original 1995 release Soul Edge. 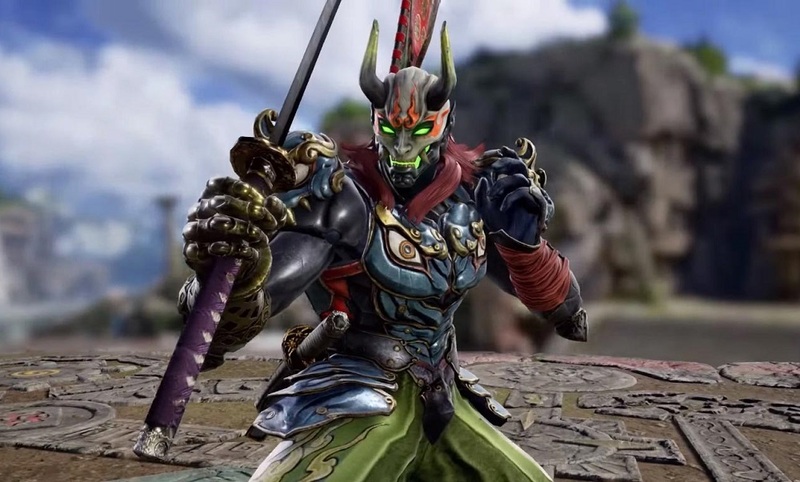 A new trailer was uploaded (then removed almost immediately) giving fans the opportunity to see Yoshimitsu in action, as well as showcasing his abstract Super, wherein he seemingly removes the soul from his opponent, before giving it a bit of the ol' slice-and-dice action. Outside of Geralt of Rivia and Zasalamel, we have so far seen only the traditional poster characters, such as Siegfried, Ivy and Taki announced for Soulcalibur VI. Hopefully some more of the latter games' lesser-known cast members also put in an appearance. Soulcalibur VI launches on PS4, PC and Xbox One later in 2018.